Building applications, even servers, as console applications is great. Easy to run, easy to debug. Easy to host in a safe, error recoverable fashion.. wait what? Yes that’s right. Not out of the box of course, and not using any of the multitude of service installers out there. 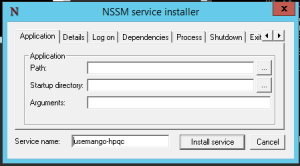 Use NSSM, Non-Sucking Service Manager. It’s been around for quite some time actually, I think I used it first time a few years ago but still going strong. Basically it provides an interface on top of the windows services runner and allows you to configure all the options you need, error and standard output logs, rolling, recovery and arguments for your executable. Simply delicious.